Home > News & Events > News > How do I make PLGA microparticles? How do I make PLGA microparticles? In general, the process for producing PLGA microparticles involves the emulsification of an organic droplet phase (containing dissolved PLGA) in an aqueous continuous phase (containing an emulsion stabiliser). The result is an oil-in-water emulsion. This emulsion is then dried to form monodisperse PLGA microparticles. This process can be easily transferred to continuous flow droplet microfluidics. Microfluidic chips with 3D pore flow-focussing junctions can be used to create a wide range of droplet sizes for PLGA in dichloromethane (DCM) solutions. Droplet size can be controlled by adjusting the size of the microfluidic junction as well as the relative flow rate of the droplet phase and continuous aqueous phase fluids, as illustrated in Figure 1. Dolomite’s unique 3D pore junction is the core feature of these microfluidic chips. The 3D pore is an opening in the channel: droplets emerging from the pore do not contact any part of the glass channel walls. This helps to give chips a long life and allows easy cleaning when working with sticky polymers such as PLGA. Once the PLGA solution is emulsified, the solvents (DCM) will diffuse out of the droplets and into the continuous phase and evaporate. 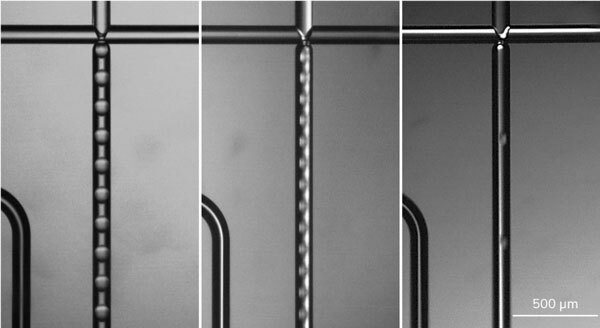 This results in shrinking and hardening of liquid droplets into PLGA beads (Figure 2). During the production run, droplets produced can be inspected on-chip by imaging the microfluidic chip using a high-speed microscope or off-chip by removing the outlet tubing from the collection vial and collecting a sample onto a glass slide or coverslip. Solvent evaporation will occurs rapidly resulting in shrinkage of the droplets and an increase in the concentration of PLGA, until eventually all the DCM has evaporated, leaving behind a PLGA microparticle. The polymer droplets settle at the bottom of the water continuous phase droplet on the glass cover slip. The evaporation process occurs indirectly, as the DCM must first dissolve into the aqueous phase, and subsequently evaporate from the water-air interface. The poor solubility of DCM in water (~2.5%) means that this process is gradual, happening more rapidly near the edge of the collected sample, where the distance for the DCM to diffuse between the droplet and the water-air interface is shorter, resulting in lower local concentration of DCM. Images taken at set intervals show this process in action, as seen in Figure 4 below. Note that while the droplets shrink at varying rates (depending on their position within the larger continuous phase droplet) the final beads are monodisperse, as they formed from droplets that were monodisperse initially. When making smaller particles, the volume of the final particle can be larger than predicted by the starting PLGA content. This is because the porosity of the particle increases, due to increased solvent extraction rates resulting from a higher surface area to volume ratio. Final particle size can be optimised by varying the starting droplet size, and PLGA concentration used. A 100 µm droplet containing 5% PLGA solution would in theory dry to form a 37 µm bead using this approximation, and a 60 µm droplet containing 0.5% PLGA would result in a 10 µm bead. The time taken for DCM extraction to run to completion will depend on the details of the drying process, volumes of materials collected and the concentration of PLGA within droplets. In the examples above, where PLGA droplets were collected on cover slides, DCM extraction was complete with 5-20 minutes. In the case of small R&D volumes (500 mg – 5 g of PLGA) solvent extraction will typically be complete within 10 –15 hours under ambient conditions. Large-scale production of PLGA beads requires specialized solvent extractors. These can take the form of relatively simple batch reactors or highly specialized continuous flow extraction equipment. If you wish to learn more about PLGA particle production or looking to explore other methods, please contact our team of experts!